Nonjatta: Yoichi 15 - "congenial"
Fourteen reviewers on the Maltmaniacs.org website gave a 2006 bottling an average rating of 87/100 ("highly recommendable"). Serge Valentin, Whisky Fun, December 28, 2006. On a 2006 bottling. 87/100 ("highly recommendable"). Serge said it was very Japanese but "beautiful". He found the nose elegant. In the mouth it was "creamy but nervous", with a powerful smoky start and developing flavours of walnut liqueur, gingerbread, sugar and a touch of mint, cloves and ginger. It had a lengthy finish with a "faint cardboardiness, lots of spices, bitter chocolate, a little salt and various nuts." Michael Jackson, Whisky Magazine, 13，16/12/2000. 8.5/10. Jackson preferred the peatier 10 year old to this c. 2000 bottling of Yoichi 15, which he described as having "lots of malt, chewy, creamy, oily." Jim Murray, Whisky Magazine, 13，16/12/2000. 9.25/10. Murray went for the c. 2000 bottling in a big way: "sheer brilliance". He found vanilla predominated in the mouth, with a "fresh, fruity, mouth-watering quality. The finish was long and unctuous, with a little smoke. I post on whiskymag (as oliver) and know Serge and read his excellent blog. I also run maltresistance.blogspot --used to, will keep it up when I found my password! What would you recommend I do to try and get my hands on the Yoichi 15 and/or the Karuizawa Sherry cask 1988 without having to pay 25 pounds in postage to a British outfit? Sorry, I missed this comment. I am not sure how people in the US are going to get hold of this stuff. Some entrepreneur surely must take up this challenge. In the meantime, it seems only Yamazakis seem to be widely available in the US. Hi - this is a very nice site considering Japanese whisky is just starting to get serious traction in the wider whisky community. I will be travelling shortly to China, and can go through a number of stop-overs where potential duty-free opportunities exist. Do you know of a good one to consider? - I really want a few bottles of YOICHI, which is damn expensive here in Europe due to silly protectionism laws. Thanks in advance! I have just been writing a chapter in a forthcoming book about Japanese whisky and found myself writing this: "It is now possible to say that if a whisky has the words "Single Malt" and "Made in Japan" on the label, the buyer can be sure that it is made my a producers with a sophisticated grasp of Scotch style whisky making." So, though I am not guaranteeing you will like everything (that is a personal taste issue), I would say you can't go wrong in terms of quality. Yoichi is usually good, but so is Miyagikyou, Hakushu, Yamazaki, Karuizawa, Ichiro's Malt (probably not available at duty free) and Fuji Gotemba. So, good luck. And beware rules liquids not being allowed in hand luggage! Wow - thanks for the speedy reply. 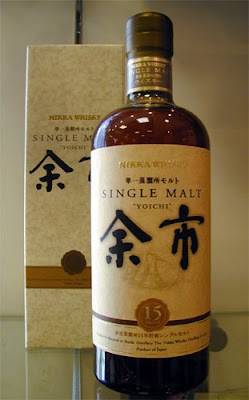 Just a quick note, flew through Narita on 6/3 and picked up a bottle of Yoichi 15 for 5500 in duty free. Good thing I get to go to Tokyo twice a month! Great! Hope you like it. Just bought and tried Yoichi 15, largely on the basis of this review.